The cigar for this review was provided by Cigars Direct; As always, all reviews are my own. 0/3: When I first started smoking cigars I smoked a lot of Alec Bradley cigars and while there are definitely some good cigars in their lineup (I especially like the Prensado and the Family Blend) I found myself smoking less and less of them as time went on. Maybe my tastes have changed or maybe there are just too many good cigars out there that I just lost touch with Alec Bradley cigars. 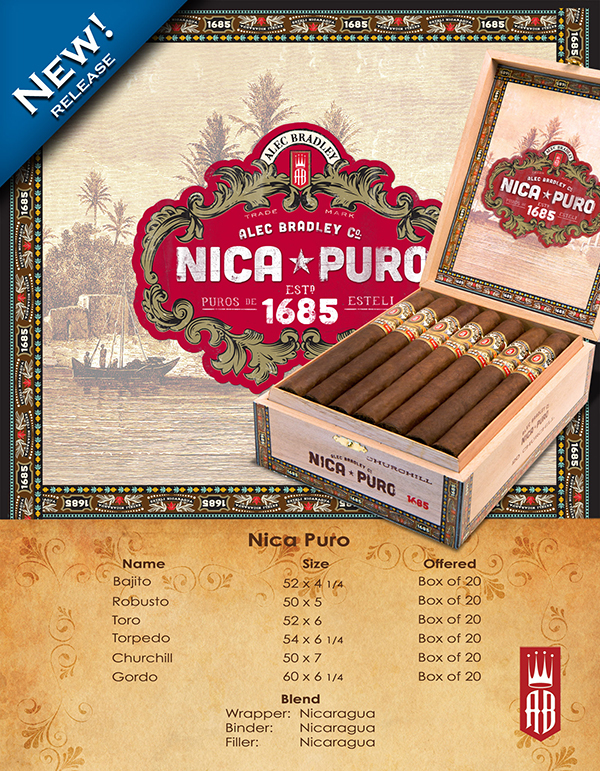 But then I saw that Alec Bradley had put out their first Nicaraguan puro, aptly named the Nica Puro, and I wanted to try it to see how good it was. It is a good looking cigar, not a lot of oils on the wrapper, nor veins, noticeably not symmetrical but pretty close. Mostly consistently packed. 1/3: How is the world suppose to end? Does it include fire raining down on the sinful masses? Well, my shorts just received their own little micro-apocalypse after I fumbled with the cigar and knocked newly lit tobacco cherries off of the foot and they fell on my shorts like a shower of small asteroids. Argh! The cigar is quite good though. This is a very good example of what I think of when I smoke a Nicaraguan cigar: a bit on the dry side, bold flavors (including spice, leather and cedar) and a general sense of contentment on my part. Not only are the flavors bold but the strength is fairly bold as well. I’d say that this is an aggressive cigar that is by no means harsh or containing an off note during this first third. 2/3: While the spice is still present, especially in the back of my nasal cavity, the main flavors I’m getting are dry earth and leather. The cedar is still present around the edges of the flavors profile and it is now accompanied by a whiff of sweetness, which rounds off any rough edges this flavor profile may have had. The strength of this cigar has moderated a bit and is now in the low full bodied range. 3/3: Copious amounts of smoke have billowed throughout the duration, which is neat and shows that there is good combustion going on, which is important for performance and the such. The flavors, however, take a bit of a turn during the final third going more for oak and a bit of spice. On its own it’s not a negative but it did take some of my enjoyment away from the cigar. Kind of a bland ending when compared to the first two thirds but not compared to cigars in general. 4/3: Full bodied with a good draw and burn; the Alec Bradley Nica Puro was, overall, a very good cigar. I especially liked the first two thirds which featured a good mixture of spice, sweetness and earth. The final third was somewhat of a drop off but still a net positive third in my estimation. I thoroughly liked this addition to the Alec Bradley line of cigars. I got to smoke one of these at the AB event at IPCPR, it was better than I expected.